Los Altos Robotics supports three robotics programs - FIRST LEGO League (FLL), Botball and FIRST High School Robotics. This web site is primarily dedicated to FLL, while further information on the other programs can be found through their respective links below. FIRST LEGO League is for fourth grade through 14 year olds. The fall season runs from September through November. Be sure and check out the 2013 FLL Season Announcements below to find recent announcements. Botball is for Junior High and High School students and takes place in the Winter and Spring. Los Altos Community team had a great 2008 season. See the fun here with videos from the California and National tournament. Our FIRST FLL regional affiliate, Playing At Learning , coordinates Northern California FLL with over 250 teams every year. In addition, they run other smaller robotics programs too such as FIRST Tech Challenge and JR. FLL. The 2013 Scrimmage was a great success! Thanks to all of our coordinators and volunteers who made it happen. We had 28 teams participate. Pictures can be found here. The calendar of events on the FLL page has been updated for the 2013 season. August 27 and September 3 - Los Altos Robotics parent orientation meetings from 7:30 pm to 9:00 pm at Mountain View High School in room 521. Event sponsored by Mountain View High School 971 FRC Spartan Robotics team. Google Map with green markers in the student parking lot (A) and close to the front door of room 521 (B). Time to start planning for the 2013 season! Talk to your friends and others at your school and in your neighborhood to start forming teams so you'll be ready to go when school resumes. The Participating in Los Altos Robotics FLL page also has the "I Need a Team List" that you can use to find a team for your child or more team members for your team. Parents are welcome to attend an informational meeting: August 27th, 2013 7:30pm-9pm at Mountain View High School (3535 Truman Avenue, Mountain View), Room 521. Come join us to learn more about the program and network with other coaches/parents. Here are last year's presentation slides. The 2013 season is here - are you ready? To stay updated on robotics over the summer, please join the TigerBots email group. The Los Altos Robotics Board of Directors (a community group of volunteers) met and agreed to put on an FLL scrimmage and tournament this year. For registration information to Los Altos Robotics, please visit the Participating in Los Altos Robotics FLL page first and then email Michael LosAltosRobotics.Org or call Michael Schuh at (650) 965-8037 if you still have questions. The Participating in Los Altos Robotics FLL page also has the "I Need a Team List" that you can use to find a team for your child or more team members for your team. The "I Need a Team List" is open and available for the 2012 season. Tournaments are lots of fun for spectators. If a child may want to participate in the future, they can stop by the event for an hour to see what it is like. If you are already a participant at another venue, please do not video robots. If you would like to help run the FLL tournaments, please email or call at the contact information listed below. Participation is great fun and great way to give back to the community. from Alex Woo for the 2010 Los Altos Robotics Scrimmage. And videos from the 2009 and 2010 Los Altos Robotics Tournaments. The 2011 FLL season was great. Visit the season results and further details for 2011 and prior seasons. Los Altos Robotics was formed in 2004 to organize and promote robotics activities in Los Altos and surrounding areas. 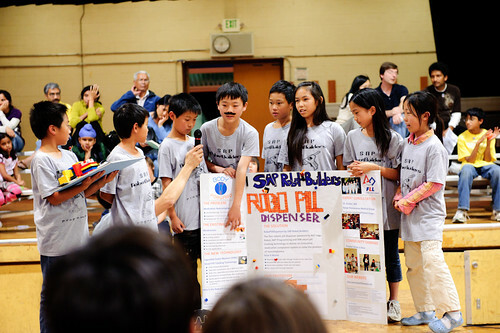 Los Altos Robotics board members have organized FLL robotics tournaments in Los Altos since 2001. This organization now contains a board of about 10 dedicated volunteers. If you want to volunteer, send one us an email and/or come to a board meeting. Meetings are open to the public. Click here to see the Los Altos Robotics board and a list of the upcoming board meetings.